Jack Engram, 85, of Herrin, passed away June 8, 2018 at Herrin Hospital in Herrin surrounded by his loving family. 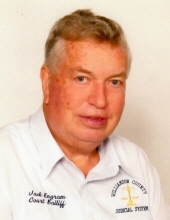 Jack was a former Police Officer for 24 years in Herrin and was the Herrin Chief of Police for 4 years. He also served as Court Bailiff for the First Judicial Circuit Court in Williamson County for 25 years. Jack loved to hunt and fish his pond. He greatly loved all animals. Jack was a member of the Illinois Police Association. He was a former member of the Masonic Lodge and a former Shriner. Jack was born in Mt. Vernon, IL on June 11, 1932 to Ruby and Inez (Beckman) Engram. Jack is survived by his son and daughter-in-law, Terry & Darla Engram of Herrin; three daughters and sons-in-law, Brenda & Arthur French of Herrin, Barbara & Jack Brian of Herrin, and Sandy & Chuck Rudolph of Mackinaw, IL; six grandchildren, Travis Engram of Marion, IL, Michelle & Bill Tauber of Herrin, Hannah & Cody King of Marion, IL, Scott & Sue Brian of Webster, TX, Johnathan Brian of Beaumont, TX, and Matthew & Jennifer Rudolph of Mabank, TX; twelve great grandchildren, Briley Engram, Bryar Engram, Brantley Engram, Abigail & Dylan Teckenbrock, Michaela Tauber, Rachel Tauber, Monica Tauber, Tymber Marie King, Sarah Brian, Seth Brian, Hunter Brian, and Gracie Brian; one brother and sister-in-law, Frank & Marilyn Engram of Herrin; and longtime friend & companion, Star Hiller of Herrin. He is preceded in death by his parents; three sisters, Delores Waller, Marilyn Wheatley, and Carolyn Barnett; two brothers, Everett Lohman and John Lohman. Services will be held 1:00 p.m. Monday, June 11, 2018 at Meredith-Waddell Funeral Home in Herrin with Rev. Don Colson officiating. Visitation will be at the funeral home from 11:00 a.m. until 1:00 p.m. on Monday. Interment will be at Herrin City Cemetery. Memorial Donations can be made to Shriners Hospital for Children, 4400 Clayton Avenue, St. Louis, MO 63110; envelopes will be available at the funeral home. To send flowers or a remembrance gift to the family of Jack Engram, please visit our Tribute Store. "Email Address" would like to share the life celebration of Jack Engram. Click on the "link" to go to share a favorite memory or leave a condolence message for the family.